It was a still morning and last night 3 cycle tourists camped in the unpowered section - they are riding from Falls Creek to Darwin and raising money for MS. Neil had a little chat to them this morning in the camp kitchen, one looked like he was ready to drop yesterday evening. There are 2 older men and an older lady. Generally before we ride off we take Kouta for a quick walk so he can dump and pee. This morning was no exception except that we can now proudly say that Kouta has officially scored his first 'road kill' not in the literal sense but that he found himself a little treat - just like how Neil finds shoes, water bottles, money etc and I am marginally a little better than Kouta and find the odd thing here and there. We got back from the walk and he is all funny around the trailer and it is like he wants to get under it but can't so he comes around to jump in but doesn't and quickly ducks under and comes up with his 'road kill' - a schmako! he quickly gobbles it down before we can take it off him. When Neil put schmakos in Koutas little bag one must of dropped unbeknownst to us and Kouta until he found it ... we are so proud - if only he could sniff out coins! 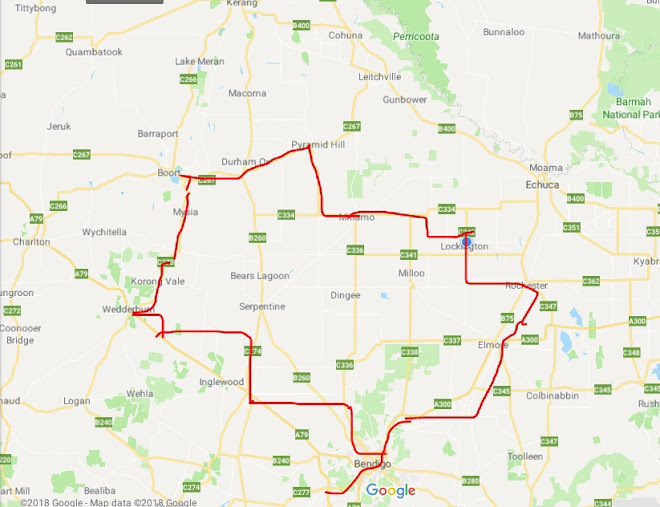 Kouta was a happy little vegemite after that ... so off we all ride along the highway for 5km then west for a few kms and then the straightest road ever south to Quambatook. Initially we thought that this would be a quiet road but between 8.30am and 10.00am this was a busy little road and it is one lane for the first bit and then once you cross over into the Gunnawarra shire it becomes a normal road. So after 10.00am it quietens down a bit and we can ride side by side. It is relatively flat and no wind to speak off. these are beautiful birds and we don't always get to see them this close to us - usually way in the distance but this one was right above us and did about 6 circles and then moved on. Since there was very little or no wind today the temperature was hot and you really felt it when you stopped and our cuppa break wasn't very pleasant - heaps of small agressive ants and loads of blasted flies - at least they weren't around when you cycled. We got to the campground just on 1pm and no one was around, had to go back to the general store and they rang up Norma who came down and opened up one of the ensuites for us. This town is on the Avoca river and last time we came here (Feb 2011) the park was still being fixed from the floods and the Avoca river was full and flowing ... today there is just a stagnant pool of green sludge the rest is dry. The park is fixed and they have a new undercover tabled area with a kitchen which isn't open at the moment and I think it is used for when the 2 dorm blocks are used - maybe for scout groups etc. At Easter there was 6,000 people here for the Tractor Pull - the campground was chockers and everywhere - it may have been a strain on the 8 ensuites. But today there is just Neil and I. We have chosen a lovely shady spot and the shower is hot and hasn't got a water saving shower head so it was a fab shower! The washing machine is free - so we washed the bedding and cycling clothes. Kouta was knackered when we got here - knackered from celebrating his road kill! 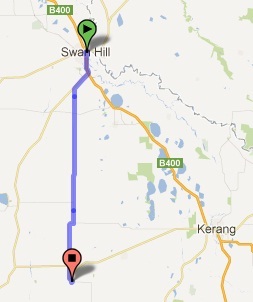 tomorrow we got to Kerang and then onto Koondrok. Have been to these 2 places before but not on the road from Quambatook to Kerang.